I bought mine with 13/51, set up for enduro. I changed the front to a 14, but i still wanted more cruisability (is that word??) I have settled on 14/48, and have tried 14/50 aswell. I have a 2x400km interstate trip coming up in a few weeks, Otherwise I would have stayed around 14/50, or perhaps split it down the middle with 14/49. 14/48 is growing on me, just had a couple dualsport trips this weekend, and it worked awesome, and was plenty low for some slight singletrack. I was still able to use all gears in loose sand, without the bike bogging down. It loves 85km/h on tarmac, but I think im pushing it a bit, when at 100km/h. Time will tell. It still wheelies in 2nd gear without effort, but 3rd requires some clutch, and a good twist on the grip. How does it wheelie in 2nd without effort? I have to drop my clutch HARD to loft the wheel. 3rd gear, forgetit. I can bounce and preload the front and pick up on it but still wont come off the ground. Here's a small unedited video, where I knew there was a little wheelie, the first one isnt so great. suppose I kneed to do some more practicing. Been really trying to decide which rear gears to go with for offroad versus street. Did a ton of math today, and figured out how to calculate tire circumference to engine RPM from any gear ratio. I figured for speeds at 5MPH increments from 60 to 85 just to see what the trade-offs in cruising RPM were. Figured stock tire diameter/circumference for the trailwing 302 and then the IRC TR8 I'm using as well as the D606. The circumference for the typical 120/90 D606 figured using the listed 26.8" diameter would be 84.19". That works out to approx. 752.5 revs per mile. I did the same thing with the 4.00 X 18 TR8 with a listed diameter of 675mm (26.58") which works out to 83.5" or 758.7 revs/mile. The stock Trailwing is listed as 25.92" dia. which is 81.42 circumference or 778 revs mile (values rounded). So, I sat down and plugged in values for diameters versus gear ratios. As soon as you plug in a larger tire, you need to go to a better rear end ratio. Bolting on the D606 really changes things. You need to go to a 3.42 rear gear just to keep the same RPM's which means the same overall gear ratios as stock. Something to keep in mind with the D606 or any tire, is how the overall circumference affects overall gearing. Plugged in several gear ratio choices with the TR8 I'm using (approx 759 revs/mile). I found out a couple interesting things. First is, if using a 3.58 (common 12 tooth front with stock rear 43) ratio with the stock trailwing and ending up at 6830 RPM at 60MPH (by doing the math), you would have to use a 3.66 gear to get to the same place with the TR8. For the D606 it works out to 3.70. That means all these gear ratios are seriously tire dependent. A 13/48 gear with a D606 is like running a 12/43 with the stock tire. Overall RPM and ratio wise, it's the same thing. I was originally going to change to a 13/47 from the 12/43 I have now (put the 12 tooth on to see how I liked it, never supposed to be permanent). I like the 12 tooth with the Trailwing, but did notice a slight performance dip with the TR8. After doing the math, I can see that I need to change to a 3.66 just to get back to where I was, so I'm just going to run the 13/48 setup since the difference in RPM between the stock Trailwing with the 3.58 and the TR8 with 3.7 is only just over 30 RPM at 60MPH. So, just kicking around on a Saturday pushing numbers around on paper. Going to order sprockets and chain today so I'll have them for next weekend. Going camping and riding next weekend, and wanted to get the drive setup finalized. Hope everyone is out having a good time on their bikes and the weather is finally cooperating. Beautiful day here, but I have to work on a set of cylinder heads for a car club member. Riding day tomorrow! Thanks for doing all the math for us. A quick rule of thumb I use is I need to add 1 tooth to the rear sprocket to maintain the same gearing for every 1/2 to 3/4 of an inch taller the rear tire is than stock. IE I like 14-50/12-43/13-47 with stock sized tires and run 13-48 with a slighter taller tire to get the gearing the same, this is my current setup, with a 110 motoz rear tire. While I didnt describe it in near as much detail as you just did I always try to bring up tire size in gearing recommendations as like you found out it makes a big difference. I like the 1/2-3/4" diameter = 1 rear tooth rule of thumb. That works out pretty well. In looking at tire options, there are so many and the diameters make such a difference with a small displacement motor, I had to bring it up. Tire weight is another issue that really affects small displacement bikes. Can't help doing a lot of math. I'm used to doing performance math for building engines, car combinations and working out dimensions for custom parts. It's a sickness. Just curious... what's wrong with the math in the Gearing Commander online calculator? It seems to account for tire size, sprocket size, and varying chain lengths. I used it for recent selection and conversion from 13/43 stock to 13/51 with 112 link chain. After running it for a couple of weeks everything operates just as the calculator said it would. Pretty cool site, and I hadn't seen that before. I plugged a bunch of numbers in it and played around with it. Need to enter the actual tire circumference instead of their calculated numbers for a new tire, since the circumferences they seem to be using are a bit lower probably accounting for a halfway worn tire. I do like that they give several options for tooth count above and below a selected custom setup so you can visualize the RPM change with gear changes. Their RPM's are higher by a bit than the manual math ends up with, but it's only a couple hundred. Their top speed ends up 1.5MPH faster at the same RPM than the math I did with the current tire I have, but that's not a lot. Like I said, never played with that before, but it's a good tool for helping select ratios. Also allows people to input actual circumference data in for different tires and see how it affects overall gear ratio. Good way to visualize changes. I was just pushing numbers around on a Saturday since it's something I like to do to stretch the 'ol brain muscles. Is gearingcommander way of, because of the 8-ish percent speedo-error on the stock bike? (my speed is gps verified) Or are my rpm's of because of my speedohealer? The bike will go 140km/h with a tailwind, but I find it hard to get used to the high rpms. As for the quote, i dont think I'll go lower than 14/48 for long dualsport runs. (the last was 1700km in 4 days, with one of the days beeing a no riding day) Now Im thinking 14/46 (just about stock)should be fine for big multiday trips, 13/46 for semi-local dualsport use, and 12/46 for singletrack and proper enduro. I'm pretty sure that Gearing Commander calculations are based on the published fixed specifications for primary drive ratio and individual gear ratios. Gearing Commander then calculates adjustments for varying tire circumference and/or sprockets. Any error in base data is magnified as speed and/or RPM increases. In your case I'm guessing your actual tire circumference is probably different than that used in the calculation. Any error inherent in the tachometer would also increase at higher speeds. For starters I'd verify that your actual tire circumference is the same as reported in the GC calculator. This field contains the calculated rear tire circumference using the stock tire Width, Aspect and Rim. Because not all tires actually have this calculated size, you can enter the size your rear tire actually has. If you do that, the field 'Aspect (%) will be recalculated and updated to reflect correct Aspect using your circumference and entered Width and Rim. By manually entering your tire circumference you can compensate for all that and have a more accurate result. More on measuring your tire circumference in the Help files. Your current 14/48 with 120/90x18 tire is only 0.04% higher gearing than stock 13/43 with 120/80x18 tire. The difference at 100 km/h calculates to only 2 RPM, so it'll be pretty hard to get much closer to stock with a 14 tooth front sprocket. 14/46 is 4.2% higher than stock 13/43, which calculates to 278 fewer RPM to reach 100 km/h. I always buy 120 link chain and cut it to the length I need. I have 4 bikes that use that chain and it makes it easier for me than to keep track how much each bike needs. I usually always have a new 120 link new chain sitting in my shop. Typically get Primary Drive X-ring or O-ring chain and keep an eye out for sales. 114 sounds about right as I recall. Then something is definatly off, my bike pulls plenty fine, and has no problems going up hills in 6th, wind in your face ect. Anyone know how many links to order for my 13 by 52 tooth enduro gearing? Have read and re-read posts on this thread....my new to me '08 WR250R runs the 606 in rear and will be used for long distance off road camping out trips. Having said that I have been doing that on my '07 GSA so moving to the WR will take a period of adjustment! Very nice having less weight and 21" front tire but do miss the on-demand massive torque of the GSA. Issue for me is what sprocket/final ratio should be my target for the WR. I want the slower rotational speed /lower wear of the 14 tooth primary and most probably combined with a 49 or 50 tooth rear/drive sprocket. This gives a slightly lower ratio than stock. My goal is to have slow speed control [with enough RMP/torque] over essentially single track rocky, root infested trails. Along with this the choice of best brands of sprockets and chain becomes a never ending quest. Is there a superior brand/type of sprocket and chain? I've had great performance from JT Sprockets steel sprockets and DID 520 VX2 X-Ring chain. I buy mine on Amazon. Below are some examples. Thanks for the lead...bought the JT sprockets [14/50] and DID X-ring gold narrow chain [120 links].. Question: How many links should I cut the chain down to? 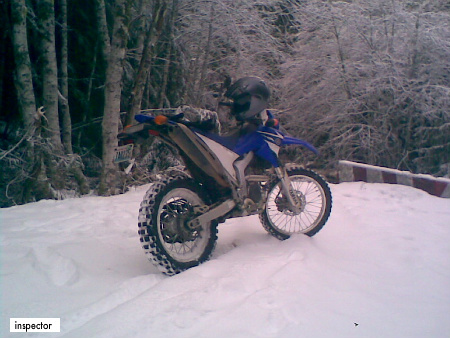 2008 WRR with Yamaha Link, lowered OEM shock and 606 120/90/18 on rear. I can't seem to find an explanation of how you fit a chain with a different sprocket combo. I can guess but that is not only expensive but not the way I want to go..
Cut it down to as many (even numbered) links that are required to put the rear sprocket as close as possible to the center of swingarm adjustability marks when the chain is properly tensioned. FWIW the shock, lowering link, and tires have nothing to do with chain length once you've selected a sprocket pair. I.e. none of those will change distance between sprocket centerlines. Personally I use the Gearing Commander website mentioned previously in this thread to select a chain length that works for me. It shows me how much sprocket changes and chain lengths will affect chain length compared to stock. I've always bought my chains at whatever length I plan to install them. Thanks yet again...stumbled my way through the Gearing Commander website and finally figured out that a 112 link chain would give me the closest adjustment range to a stock set of sprockets with a 108 chain...will cut down my new DID from 120 to 112. Again I will verify by centering the adjustment block/axle and counting the links...was not sure if the suspension data was relevant to chain length...guess it wasn't and do appreciate the information.. I'm intrigued by the possibility of easy gear changes by using a 47 or 48 tooth rear, and picking up a 12 and 14 tooth front. According to the first post, I could leave the rear sprocket alone and just change out the front. Run 14/48 on the road, 13/48 on the trails, and 12/48 when I go to the sand. Any thoughts on this plan? Which would be better for fitment? I could go either way on the 47 vs 48. Theres about a 2% difference between 47 and 48, the tire you used will have a much bigger impact on the final gearing. I'm wondering if with the 14/48 tooth, will I be up tight against the front with the axle, or with the 12/47 will the axle be tight against the back, not allowing me to adjust for any stretching. Like stated, the size of the tire has more to do with it than the difference between 47 and 48 teeth, so any input as to which will fit better with axle adjustment?